The Dark Knight Rises, Catwoman's costume revealed. 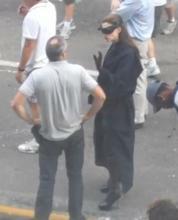 The first pics of the new Catwoman's costume were revealed yesterday, very interesting... (this is a stunt double, not Anne Hathaway herself). I would call Anne herself "a fetish" ;-) Love her outfits in "The Devil Wears Prada". Ah, I thought I'd already posted that. clearly not. New suit looks very tight. I love those spike heeled boots. Thanks for posting.